I attended The Massive Tech Show this week at Canada Place in Vancouver, where local businesses can explore technology through the various scheduled events at the interactive exhibits and daylong flurry of presentations. It’s a great event where participants can take advantage of the networking opportunities from the businesses involved and the many sponsors in attendance. There was a tremendous line-up of speakers and keynotes at the conference: Leonard Brody of NowPublic fame, and Kerry Munro, Yahoo! Canada GM, to name a mere two. I was lucky enough to stumble into Captain Ajax himself, in the flesh, upon arrival (many thanks for the ticket!) and sat in on his Blogging For Business presentation. It was excellent – to the point, concise and informative for those people looking to the blogosphere for community outreach but not sure how and what and why it’s important to their business. Andre covered all the bases. Check out some of my flickr photos taken during his presentation, and find his slideshow on his session over at his blog. I once again enjoyed my small stint of being a Bryght girl, while I briefly relieved Roland of his booth duties so he could grab a quick bite. And then I was relieved shortly after when Scales arrived – I think together we made a quick sale or two!! As always at these types of events, I met some good people, and it provided the chance to catch up with the old. I’d recommend it to anyone in Vancouver (or use it as your excuse to get here for a day or two!). The sessions and speakers are good people to meet and learn from, but if for nothing else, head there just to wander the floor of the exhibits – lots to see, lots to do, plenty to take in. Keep your podcast subscriptions tuned into ThisCityRocks for (*wink*) Season 2… we’ve got a HUGE line-up of Canadian Indie bands we’re going to feature over the coming months, many of those bands seen above, plus more up and coming bands when we cover The Whistler Ski and Snowboard Festival in April, New Music West in May and in the summer, WakeFest (line-up on their site coming soon) in July. Don’t miss the first interviews of 2007 with Malajube, Champion and YouSayParty!WeSayDie! coming realllllllly soooooon! I was honoured to be asked to participate in The Pacific Festival of the Book in Victoria this past week-end, and to conduct an afternoon workshop on publishing work online in an introduction to social media. MediaNet asked me to visit Victoria to give a presentation at the festival, and to hold a workshop afterwards with the members of MediaNet, highlighting some useful online tools that independent filmmakers can use to promote their work and grow their online community and presence. The presentation was really well received, and I know this fine fact from the number of excited participants expressing their sincere thanks and gratitude to my time, effort, knowledge and energy. To be perfectly honest, the energy and time given to sharing what I have learned and know is the fun part. It wasn’t that long ago when I was in their shoes and very new to the material, so I know when certain things are over some heads, recognizing and relating to the blank stares and glazed-over eyes. I’m happy to be able to talk to people who know very little about the power and use of the internet and introduce them to the space. And mostly, this is easy and enjoyable because I love it. A-ha! And therein lies the answer! Thanks to Peter at MediaNet, Passia Pandora (check out her new blog! ), Scott Amos, all the participants in the afternoon workshop – I look forward to your high-powered blogs!, Pattie Lacroix, Izzie Egan (once again, your story drove home such an important point for paper-driven businesses!! ), Krug (we checked out your flickr during the presentation and talked about your professional photography in relation to your CopyCamp copyright story on the London pics! ), and last but not least, Kelly and Meisha. Victoria + internet jargon = good times all around! 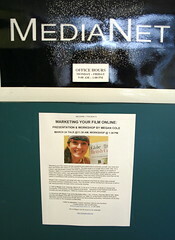 This week I am heading over to lovely Victoria, BC, to conduct a workshop on marketing your film online at Media Net. Last fall, I was invited by Telefilm Canada to spend some time in Newfoundland at the St. John’s International Women’s Film Festival, where Pattie Lacroix and I spoke to the film participants about promoting their work online. To a large degree, it was essentially an introduction to social media, showing the internet-curious audience how to tap into softwares that are easy and accessible to help promote and share work online. One of the participants of the workshop in St. John’s was Passia Pandora from Victoria. She and I have continued to stay in touch since the festival, as she quickly became excited and addicted to the online space, once she witnessed the power of it all first-hand! Passia has since connected me with Media Net in Victoria, which is where I will spend an afternoon this week, as a part of the Pacific Festival of the Book. I’ll also be joined by podcaster Scott Amos. We’ll each spend about an hour introducing some technology and showcasing tools, and then all participants will spend some time getting their hands dirty on computers, online!, setting up profiles, becoming familiar with the various softwares and interfaces and walking through the features. Looking forward to meeting some more internet inspired creative people! Relatively new to the blogosphere, but kind of an old hat in the art world (and fairly well schooled thus far as well! ), Beyond Robson has just discovered the increasingly famous Izzie Egan and featured the gallery manager of the Monte Clark Gallery in this week’s installation of Cityphile! Hey Internet: Saskatchewan’s Got It Goin’ On! I just got back from sunny Saskatoon (sunniest city in Canada: fact.) and let me just say that this “Paris of the Prairies” town of 200,000, in a province that’s 700,000 square km., has a lot happening and much to offer. Talk to anyone from there, and this, they have always known. It’s time for the rest of us to have a peek and take some notice. This year marked the second annual Saskatchewan Interactive conference, organized and funded predominently by local businesses. The focus this year was “well beyond websites”, with a great blend of interactive gaming, mobile, and social media content. The conference started out with a dinner on the first evening for the speakers introduction, and then continued for HOURS, with all of us meeting, mingling and competing in front of several massive projector screens, where we could each have a go at Wii, Super Mario Brothers and even Pong! 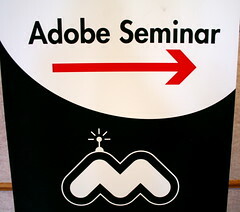 I was invited to speak this year on an introduction to social media, web 2.0 and citizen journalism. The sessions were recorded and the organizing committee has a copy of each speaker’s presentation, so hopefully I can point to that very soon once they get it up on the official site. It was an inspiring place to be. There were some great people involved: Keynote John Lester from Linden Lab, who brought us all into Second Life, a second Keynote, Mike Parkhill, Director of Education at Microsoft Canada, Ian Verchere, CCO of Vancouver’s Shift Control Media, Daivd Voigt from Mobile Muse, who talked to us about mobile culture and content, Roland Tanglao from Bryght gave his infamous EverythingCasting presentation, among many other educators, innovators and technologists from all over North America. Check the speakers page for a full run-down. The buzz and energy has already begun in looking forward to next year’s conference, which, if this year was any indication, promises to be nothing short of fantastic. I want to thank some people here: Barbara Rackham and Deborah Black of DBlack Communications and Ryan Lejbak from zu.com all played a key role in getting this conference up and off the ground, and their hard work was evident. It was great to have Roland from Bryght with his expert and veteran insight, and to show a newbie to the Toon around town. Thanks as well to Izzie Egan, Kris Krug, Robert Scoble, Raincity, Dave Olson and Marion Ryan – all of you had a hand in shaping my presentation, whether you know it or not, so thank-you! And to all of those crazy cats from zu, an old home of mine and one that I miss, it was a treat to hang out again. I hope to see you soon Saskatoon! Last week I spent the afternoon hanging out at Projections with Nilesh Patel. I interviewed this director/producer for Capital Magazine on his award-winning documentary, Brocket 99 – Rockin’ The Country. The interview is live over at the Capital Magazine site. Brocket 99 explores the relationship between aboriginal and non-aboriginal Canadians, and the history and reactions from the infamous cult tapes of the 80’s, a parody on a reservation radio station. If you’re in the Toronto area in April, Brocket 99 – Rockin’ The Country will be screening at the Real World Festival, April 11 – 14.